Yesterday we showed you 10 different ways to make the most of your iPhone's front facing camera, but today's app takes shooting video with your iPhone to a professional level. 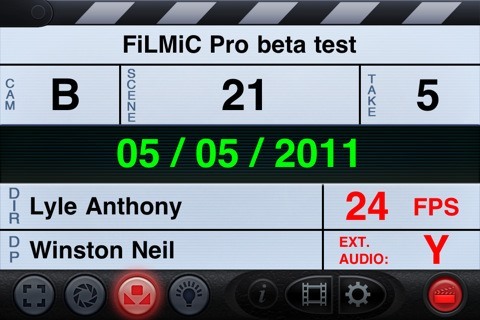 Highly recommended by our resident filmmaker, Mike Goedecke (see his RED ONE camera tutorials here), FiLMiC Pro is a professional app for shooting industry standard video on the iPhone. The app stretches the high definition capabilities of the iPhone 4, allowing users manual control over the camera's functions. It offers three separate focus and exposure modes, which you can lock in place. It also offers a whole slew of industry tools: Variable frame rates (1-25 and 30fps), which includes both the US (24p) and European (25p) film production standards; 4 different selectable resolutions; framing guide overlay (4:3, 16:9, & 2:35.1); a Thirds Guide for composition; audio metering; and color bars for post production. Once finished, users have the option to upload directly to DropBox, YouTube, Vimeo, Facebook or an FTP Server. Ready to shoot a Hollywood movie? The app is available on iTunes for $2.99. Check out sample footage from YouTube user xJOHNxSTREITTx below. Great info, Thanks! I have this app and it is amazing!